Premium grade bullets are here to stay and one of the best is the locally produced GS Custom, the brainchild of Gerard Schultz of Port Elizabeth. In the 1990s Gerard designed a monolithic hollow-point which was very successful, so he followed that up with two new designs; a high velocity hollow-point and a high velocity flat-nose bullet. In 1996 I used a 7mm Magnum, loaded with his original 140gr 7mm hollow-points (which are still available) to shoot a huge kudu bull at 284 paces. As I am not a ‘speed freak’, I basically ignored Gerard’s high velocity bullets thinking that I had no use for such bullets. However, recent tests convinced me that even staunch supporters of the slower-is-better school can find these bullets useful. To fully understand how the design works a brief explanation on the general design of the hunting bullet is necessary. All hunting bullets have what we call an ogive (the curved portion that ends in the bullet tip) and a shank (the cylindrical section behind the ogive). The shank also defines the bearing surface, the portion of the bullet that touches the lands and grooves when the bullet is in the barrel. The diameter of the shank must match the biggest inside diameter of the barrel, called the groove diameter — for a 7mm bullet this is normally .284 and for .30 calibres .308”. A rifled barrel has lands (the spiralling raised portions in the barrel) this means the land to land diameter is obviously smaller than the groove diameter. When a bullet moves through the barrel, the lands ‘bite’ into it over the entire length of the shank (bearing surface) which causes the bullet to spin — a prerequisite for good accuracy. The lands however, also increase the friction between bullet and barrel. Thus, bullets with long shanks will create higher pressure than bullets of similar weight with shorter bearing surfaces, all else being equal. Higher pressure also means higher velocities, but when increasing the powder charge you will eventually reach a point where the pressure rises very rapidly with very little or no gain in velocity. When reaching this point, one way to increase velocity (using a bullet of similar weight and the same given powder) is to reduce friction in the barrel by reducing the bearing surface of the bullet. That allows the reloader to increase the charge, hence also the velocity. That is exactly how Gerard’s HV bullets work. Notice in the photo that they have concentric rings, called driving bands, on the shank and only these match the groove diameter of the barrel. This means that the lands engage (‘bite’ into) far less copper than with conventional bullets. HVs thus build up pressure slower and in general, achieve higher velocities than conventional bullets of similar weight in any given calibre. Gerard claims that the reduced bearing surface is not the only reason why his bullets are faster, but as the explanation of this is very technical I suggest that you contact him for further details. The above information is basically all the average reloader needs to know. GS bullets are turned on high-quality, Austrian-made CNC machines from 99.9% pure copper bars and tolerances are held to less than 0.005mm. Even the room temperature is controlled to ensure that heat expansion of the equipment or copper bars does not affect the final sizing of the bullets. Finished bullets are measured at least four times on a Swiss digital micrometer (accurate to 0.001mm) to ensure that dimensions are kept within specs. These careful production methods not only ensure that all bullets are cosmetically pleasing to the eye, but also that their weight is very uniform. I weighed ten bullets each of three calibres, then did the same with three popular imported brands of bullets to check uniformity of weight — the GS bullets won comfortably. For this test report I used l30gr HVs in my 7x57 and .308, and in my .375H&H the 265gr HV and 270gr FNs. Because of their solid construction, monolithic bullets do not mushroom or break up in the same manner as conventional bullets, and therefore penetrate better than conventional ones of the same weight. In wet-pack tests I have found that a 150gr monolithic fired from a .30-06 penetrates as well as a conventional 220gr bullet. With monolithics the hunter can thus go to a lighter bullet. Lighter weight also means higher velocities and flatter trajectories. None of the abovementioned calibres are rated as long-range performers, but with GS Custom bullets they become very useful for open plains or mountain hunting. My 7x5 7 is not normally very happy with l30gr bullets and I did not expect too much from the GS bullet. However, this bullet is very long for its weight, as long as conventional 175gr bullets, and to my delight it printed MOA 3-shot groups at l00m when launched by 40gr S335 and loaded to an overall length of 77.5mm. Recorded velocity was 2806fps. I upped the charge with two grains which gave an average velocity of over 2900fps from my Mauser’s 21-inch barrel and 1.2" groups at l00m — still acceptable for most hunting purposes. What really pleased me is that the 2800fps load and my normal hunting load (145gr Speer/2500fps) had exactly the same point of impact at l00m. The GS bullet has a high ballistic coefficient factor due to its shape, retains velocity very well and drops about 4-inches less at 300m than the Speer bullet. This flat shooting bullet has turned my 7x57 into an acceptable long-range calibre for open plains or mountain hunting. I cannot wait to take on those elusive vaal rhebuck in the Karoo with the 130 grainers. In my .308 the l30gr bullet produced even better accuracy. 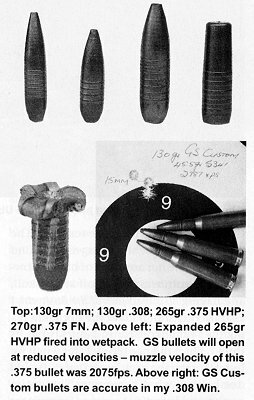 A charge of 45.5gr S341 gave an average velocity of 2787fps and 3-shot groups under 0.78” (20mm) at l00m — the best measured 15mm.In front of 42.5gr S335 the GS bullets averaged 2854fps, but groups opened up to l.3" at l00m. Both the loads (OAL 69mm) shot to the same point of impact as my standard l80gr hunting load, which means that I can also use two loads in the .308. These loads showed no signs of high pressure in my rifles and could have been increased, but I did not bother as the ballistics were already more than needed. Remember that GS bullets will probably require a bit more fiddling with seating depths than is necessary with conventional bullets to achieve top accuracy. With the .375 I followed a different route. GS Custom’s literature states that velocity has no influence on the accuracy of their bullets. To test that claim, I loaded six 270gr FNs in front of 24.5gr S265 and another three in front of 64gr S335. The former load achieved 1351fps and the latter 2398fps. Shooting from a bench and using a ghost ring I had no problems putting three shots into one inch with both loads. With the 265gr HV it is easy to surpass the normal ballistic specs for the 270gr bullet (2700fps). In my 21-inch barrelled Mauser 69.Sgr S341 pushed the 265 grainer to 2730fps and 7lgr of the same had the HV screaming over the sky screens at 2800fps. These loads seemed mild in my rifle and the velocities can no doubt be upped but they were fast and flat shooting enough for my hunting purposes. Both loads produced 1.1" groups at l00m. The penetration and weight retention abilities of monolithic bullets are well-known and the GS Custom is no exception. Wet-pack tests have showed that they retain up to 90% weight with normal hunting loads. Curious to see whether they would expand at reduced velocities I loaded a 265gr .375 bullet in front of 50.5gr S335 for a velocity of 2075fps and fired it into a wetpack from 40m. Alan Henry of Natal Gun Company witnessed the test: The perfectly expanded bullet weighed 264gr on recovery. This one will not only work well in the bushveld, it is accurate too. With the ghost-ring I could put three shots into less than an inch at 50m. Unfortunately I was not able to test the GS bullets on game, but I know many hunters who have used them with total satisfaction. GS bullets are available in a wide range of calibres. They are of very high quality, cheaper than imported monolithics, and will serve hunters well. For detailed information on GS products visit their website or contact them on (084) 338 3006. GS Custom Bullets, situated in Port Elizabeth on the East Coast of South Africa, manufactures solid copper, turned, monolithic bullets for hunting and sport shooting. These bullets are used by hunters on several continents, hunting from the smallest of antelope to the largest of dangerous game, using the smooth HP bullet, as well as the more popular HV, FN and SP bullets with the patented drive band concept. GSC bullets are configured for the highest possible ballistic coefficients. SP bullets are mainly used for sport shooting. All GS Custom Bullets are moly coated.